Six months ago people along the Texas Gulf coast were bracing for what would become one of the worst natural disasters in the history of the United States. 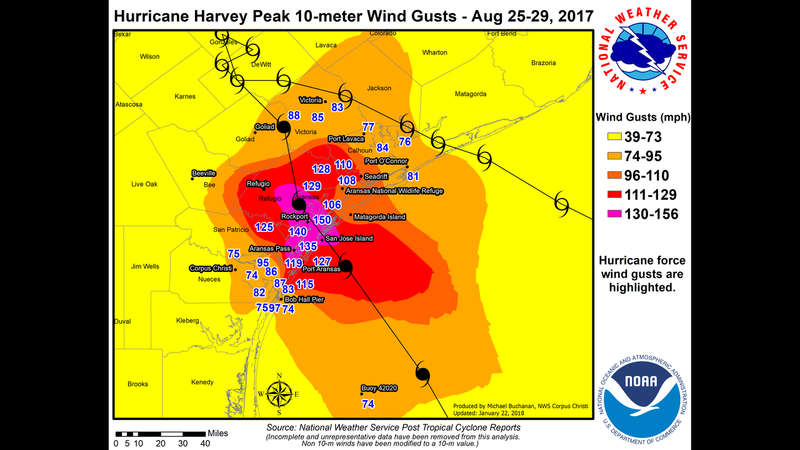 Hurricane Harvey made landfall about 10 p.m. on Aug. 25, 2017, on San Jose Island, as a Category 4 storm with winds of more than 130 mph. It quickly made a second landfall near Rockport, Texas, crossed over the Copano Bay and made a third landfall a few miles north of Mission Bay in Refugio County. A gauge shows the depth of water a an underpass on Interstate 10 which has been inundated with flooding from Hurricane Harvey on August 27, 2017 in Houston, Texas. Harvey, which made landfall north of Corpus Christi late Friday evening, is expected to dump upwards of 40 inches of rain in Texas over the next couple of days. Texas National Guardsmen rescue people from flooding caused by Hurricane Harvey in Houston. People walk down a flooded street in Houston after Hurricane Harvey. Residents evacuated from their homes in the Cypresswood Creek subdivision in north Houston. Harvey moved inland to just northwest of Victoria where the storm stalled for days, funneling copious amounts of moisture into Southeast Texas. Wave after wave of torrential rain broke records, producing more than 50 inches of rain in the Houston area, resulting in devastating floods. After nearly five days, Harvey moved east of the region, ending the rains. Flooding would take weeks to subside. More than 60 people died in the storm. More than 300,000 structures were flooded. More than $120 billion in damage was caused. Here are more numbers from the National Hurricane Center that help tell the story of the historic devastation caused by Hurricane Harvey. 132 mph - Harvey’s maximum winds of 132 mph occurred during a several-hour period concluding with its first Texas landfall. 111 mph - The highest observed sustained winds on land were 111 mph near Aransas Pass, with the highest observed gust being around 145 mph near Rockport, Texas. Hurricane Hiki. For the continental United States, the previous tropical cyclone rainfall record was 48 inches in Medina, Texas, from Tropical Storm Amelia in 1978. 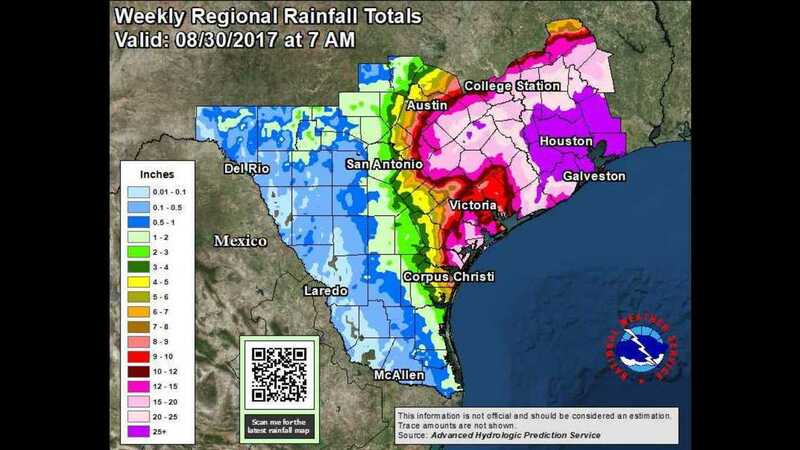 18 recorded values over 48 inches of rain - It is remarkable that during Harvey, 18 values over 48 inches were recorded across southeastern Texas, with 36 to 48 inches recorded in the Houston metro area. These rains caused catastrophic flooding in Harris and Galveston counties. 6.8 inches of water in an hour - The rain rates observed in these bands on Aug. 26-27, 2017, were exceptional, with 6.8 inches of rain in just one hour documented in southeastern Houston from extremely heavy rain bands training over the same location. The front hardly moved from August 27-28, leading to the extreme rainfall totals in the Houston metro area since the main inflow band originated over the very warm waters of the northwestern Gulf of Mexico, which provided multiple influxes of warm and humid air. 57 tornadoes - Harvey was a prolific tornado producer. There were 57 tornadoes preliminarily reported during Harvey, about half of which occurred near and south of the Houston metro area. 68 people died - Harvey is responsible for at least 68 direct deaths in the United States, all in Texas. Over half of the deaths (36) were in Harris County in the Houston metro area. All but three of the deaths were from freshwater flooding, and none of the deaths can be linked to the storm surge, which is quite remarkable for a category 4 hurricane landfall. Still, Harvey is the deadliest U.S. hurricane in terms of direct deaths since Sandy (2012) and is the deadliest hurricane to hit Texas since 1919. About 35 additional deaths are ascribed to indirect causes, such as electrocution, motor-vehicle crashes and isolation from necessary medical services. Four people were reported injured by a tornado north of Reform, Alabama. NOTE: Deaths occurring as a direct result of the forces of the tropical cyclone are referred to as “direct” deaths. These would include those persons who drowned in storm surge, rough seas, rip currents, and freshwater floods. Direct deaths also include casualties resulting from lightning and wind-related events (e.g., collapsing structures). Deaths occurring from such factors as heart attacks, house fires, electrocutions from downed power lines, vehicle accidents on wet roads, etc., are considered indirect” deaths. many factors, including that a majority of the residential flood loss claims are from outside the 500-year floodplain, where there is low National Flood Insurance Program (NFIP) participation, with tens of thousands of claims still outstanding. 300,000 structures - The damage caused by Harvey’s flooding was catastrophic over a large area of southeastern Texas. Over 300,000 structures in that region were flooded.